It’s always a bit of a distraction to play on a major holiday, December 23rd being the annual secular, alternative celebration of Festivus. So perhaps appropriately, Bulls coach Fred Hoiberg Saturday after the Bulls 117-92 loss to the Boston Celtics aired his grievances. It might have been remarkable if the now 10-22 Bulls could have taken this one against an energetic and motivated Boston team that had been overwhelmed in the United Center earlier this month. That game was without Celtics star Kyrie Irving, and he was transcendent Saturday, especially in one of the better first halves two teams could play. 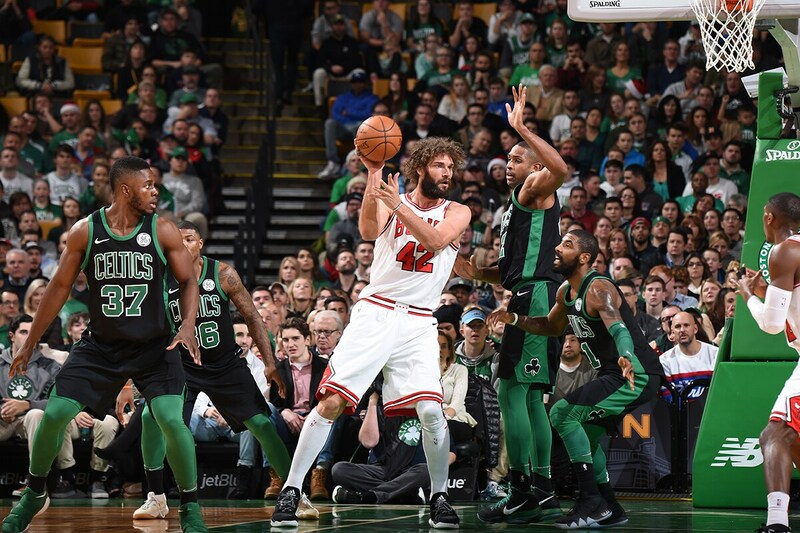 The Bulls were dynamic for 24 minutes, 17 assists on 23 baskets with just three turnovers, 13 fast break points to four for Boston, a 28-19 rebounding edge and a 49-42 Bulls lead midway through the second quarter when Celtics coach Brad Stevens rushed Irving back into the game. The Celtics do-everything player on offense proceeded to make back to back threes and a finger roll layup that saved the Celtics with a 60-58 halftime lead. The Bulls could not match it this time, a Celtics 38-18 third quarter avalanche that buried the Bulls, Hoiberg with two timeouts four minutes into the quarter, 13-2 Boston to start the quarter and then another 15-8 after a futile attempt at Bulls energy with Nikola Mirotic and David Nwaba coming in. At 98-76 Boston after three, there was no Festivus miracle for the Bulls. Lauri Markkanen and Justin Holiday had 12 points each, Markkanen with 10 in the first half. Nwaba had 11, though a shaky three of eight on free throws. Jerian Grant had 10 points and Nikola Mirotic had nine points and a team best nine rebounds. 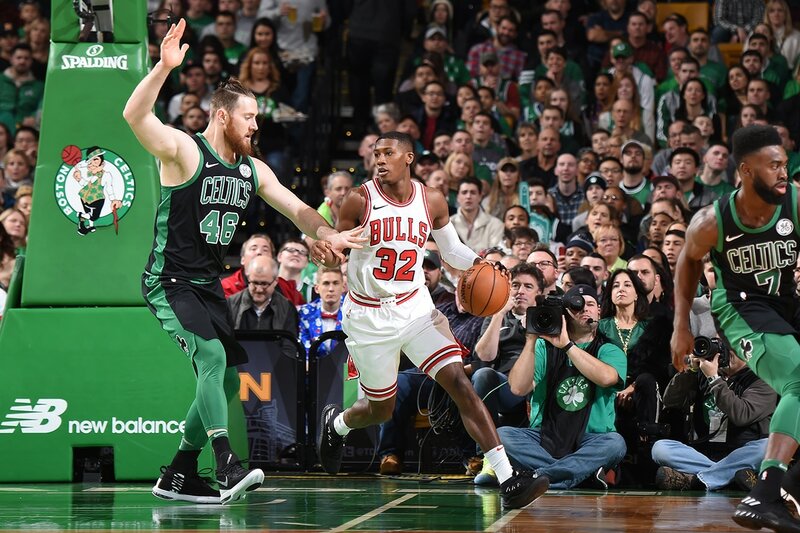 Kris Dunn had a chilly return home to New England with two points on one of 12 shooting, though with seven assists. “Those are my shots, shots I work on and shots I hit,” said Dunn, who is from Connecticut and had about two dozen family and friends at the game. “I feel like I had plenty of good looks. They didn’t fall today; that’s part of the game. I had plenty of bad games like that. Just go look at the film, see what I can fix. Not going to get down on myself, still going to be confident. The Celtics were better and now are 27-9. But they needed a big time dose of Irving in the first half to rescue them with 16 of his 25 points. 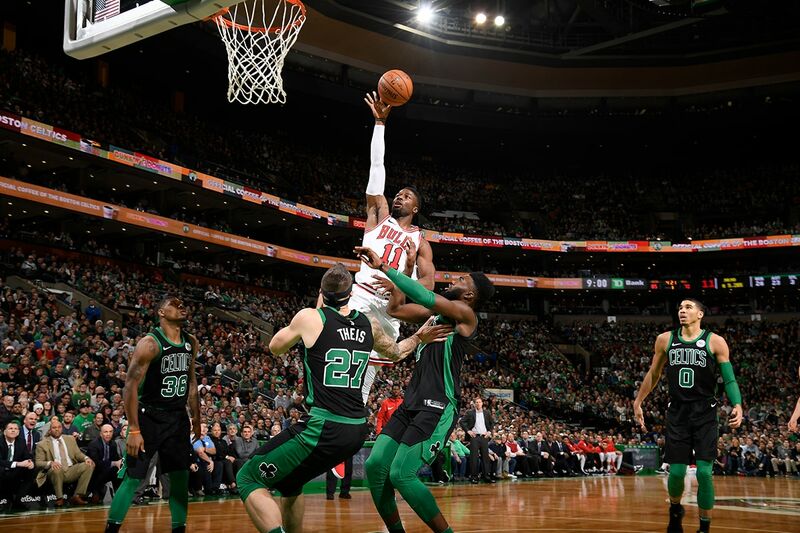 The Bulls were beginning to pull way, like they did two weeks ago in a 23-point win over Boston without Irving, until Irving returned earlier than usual in the second quarter. Irving was having his way in the pick and roll, and when the Bulls tried to blitz and trap, he passed to open shooters. They made them. It’s not clear they could have without Irving drawing the extra defenders. It wasn’t unlike the Thursday game in Cleveland in some respects. In that game, the Cavaliers needed a dynamic stretch from LeBron James to close the game, basically making every score and play the last six minutes to provide the margin of victory. The Bulls don’t have that kind of player, at least active at this time. They hope it can be Zach LaVine, who isn’t due to return from his February knee surgery until probably sometime next month. So they have to be an ensemble for now. But they remain confident the band hasn’t been broken up. In the last 15 games, Saturday’s really was the only game other than against the Cavs earlier this month that the Bulls weren’t winning or close in the last seconds. That sort of confidence, if not compete optimism, was evident even after Saturday’s game. It was an atmosphere different from that during the 10-game losing stretch last month. Then there was hope with perhaps some uncertainty. This time the players seemed to face the final result as more aberration. It was an energized Celtics team coming off back to back losses and with the fresh memory of that beating in Chicago. But the Bulls counter punched immediately even with Boston shooting a shocking 71.4 percent in the first quarter. Even with that it took a Marcus Smart three-point play with 2.6 seconds left to give the Celtics the lead, 33-31. The Bulls were opportunistic as well, Mirotic shooting an air ball that Portis caught for a layup, Denzel Valentine starting fast with five of the first seven points, Holiday and Markkanen shooting with range. Then it was Portis’ force that set the Celtics back to open the second quarter. The Bulls reserve forward pounded inside on three consecutive possessions to open the second quarter. Mirotic added a three and then threw to a diving Portis for a three-point play and 47-42 Bulls lead. Boston still was shooting 60 percent and trailing. Irving to the rescue, diving around screens and orchestrating like the star he has become for the Celtics. Still, the Bulls matched shots with Portis’ 11 second quarter points. Just a basket behind at halftime. And then the aluminum pole hit them between the eyes, turnovers on three of their first six possessions of the second half, a quick 10-point deficit and then the inevitable isolation plays and extra dribbles to try to save one another. Which only makes it worse. Though the Bulls remain confident there are better times. “We have to be ready for Tuesday because we are facing a Milwaukee team we took down in their own building, so I know they are going to want to get their (revenge) against us, too,” said Portis. “I think in the first half you saw us continuing to play good basketball; just what happened in the second half hurt us.